At the end of World War II, thousands of Nazis who participated in the systematic murder of some 6,000,000 Jews and millions of Gypsies, Poles and other "inferior" peoples, slipped through the Allied net and escaped to countries around the globe, where many still live in freedom. 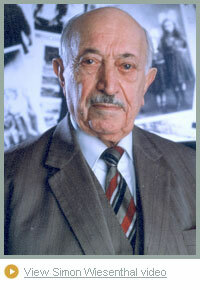 Simon Wiesenthal, a survivor of the Nazi death camps, dedicated his life to documenting the crimes of the Holocaust and to hunting down the perpetrators still at large. "When history looks back," Wiesenthal explained, "I want people to know the Nazis weren’t able to kill millions of people and get away with it." His work stands as a reminder and a warning for future generations. sians in 1941, a former employee of his, then serving the collaborationist Ukrainian Auxiliary police, helped him to escape execution by the Nazis. But he did not escape incarceration. Following initial detention in the Janowska concentration camp just outside Lvov, he and his wife were assigned to the forced labor camp serving the Ostbahn Works, the repair shop for Lvov's Eastern Railroad. This new multimedia exhibit was made possible by a gift of Alan and Susan Casden.